Learn about Museum membership benefits. Frida Kahlo at The Dali showcases the extraordinary career and life of the acclaimed 20th century artist, whose dreamlike work suggests that love and suffering create a new sense of beauty. 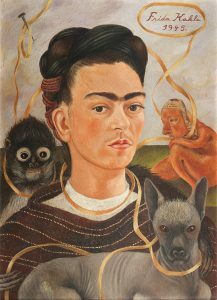 More than 60 Kahlo pieces are on display, including 15 paintings, seven drawings and numerous personal photographs from the celebrated female artist and influential icon. The exhibition extends outdoors, where a special collection of flowers and plants representative of those in Kahlo’s own garden at Casa Azul, her home in Mexico, graces the grounds of our Avant-garden. The exhibit is an intriguing exploration of the life of Kahlo, her striking artwork and her fascinating psyche. Together with the exclusive photographs of family, friends and lovers, the exhibition gives a complete view of Kahlo’s world, along with the joys, passions and obsessions of this remarkable artist. Kahlo and Dali each created artistic autobiographies and their personalities loom behind their paintings, generating a presence that both shapes and overshadows their works of art. While Kahlo largely rejected the term ‘Surrealism’ and felt that her works were as real as her life, Andre Breton, known as the founder of Surrealism, took great interest in her work and described her painting as a bomb wrapped in a ribbon. This special exhibition is included in your Museum admission. Frida Kahlo, Autorretrato con changuito (Self Portrait with Small Monkey), 1945 Oil on Composite Board. Collection Museo Dolores Olmedo, Mexico City © 2016 Banco de Mexico Diego Rivera and Frida Kahlo Museums Trust, Mexico, D.F./Artists Rights Society (ARS), New York. 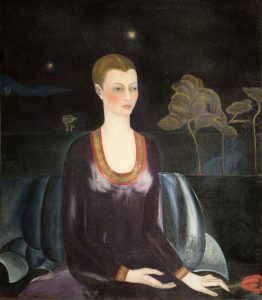 Frida Kahlo, Retrato de Alicia Galant (Portrait of Alicia Galant), 1927 Oil on Canvas. Collection Museo Dolores Olmedo, Mexico City © 2016 Banco de Mexico Diego Rivera and Frida Kahlo Museums Trust, Mexico,D.F./Artists Rights Society (ARS), New York. 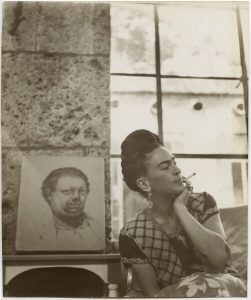 Frida Kahlo, 1945 [seated next to a lithographic stone of Diego Rivera’s 1930 self-portrait, Casa Azul]. Photograph by Lola Álvarez Bravo, ©1995 Center for Creative Photography, University of Arizona Foundation. Vicente Wolf Photography Collection. 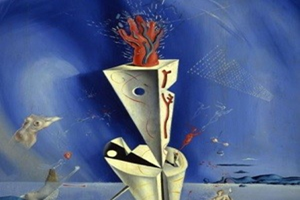 This exhibition has been co-organized by The Salvador Dali Museum, St. Petersburg, FL and the Museo Dolores Olmedo, Mexico City. Image: Guillermo Kahlo, Portrait of Frida Kahlo, 1932, Collection of Vicente Wolf. 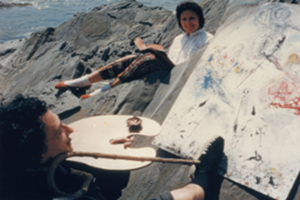 The permanent collection includes over 2,100 works from every moment and in every medium of Dali’s artistic activity. This special exhibition includes 48 images revealing candid moments of the artist by French photographer and close friend of Dali’s, Robert Descharnes. 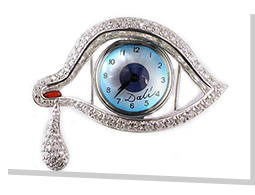 Discover hundreds of Dali-inspired items reflective of our collection, including books, apparel, fragrances, art, home decor, jewelry & watches and more.